Yup, that was the sound I woke up to. I kid you not. It was about 4 am, I think. Again, I kid you not. 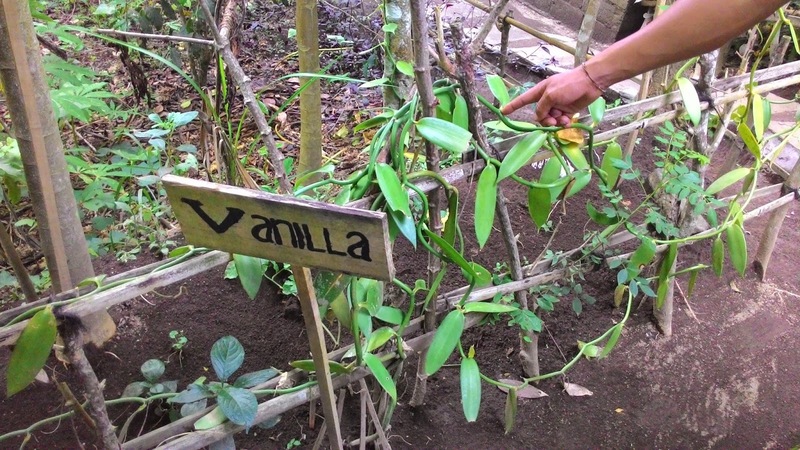 When reading reviews about the villa, I had come across a mention of the rooster, but I chose Sanur over the Ubud villas, where due to the proximity with the rice fields, all sorts of animals were expected to invite themselves to your villa! That was wayyyy scarier than a rooster just trying to wake people up from a distance. Anyway, I went back to sleep, but by 6 am, it was so bright I couldn't sleep anymore. Mom and Dad were of course up even earlier. 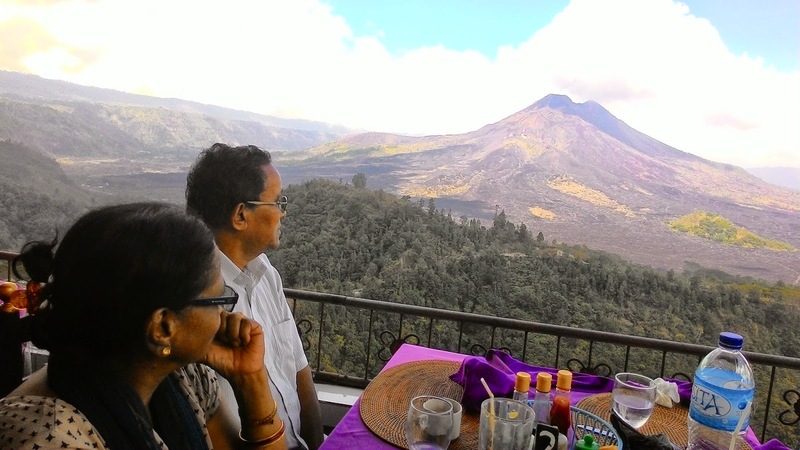 We had breakfast and then headed out for our day of adventure - Goa Gajah temple, Mount Batur volcano and Lake Batur in Kintamani, coffee plantation, rice terrace and artisan's village. Our driver was there at 8 am - half an hour early! Our villa had several frangipani trees, and flowers kept falling all day. My mom put one in Xena's hair and she loved it! I demanded one too, and soon, all three ladies had one in their hair. 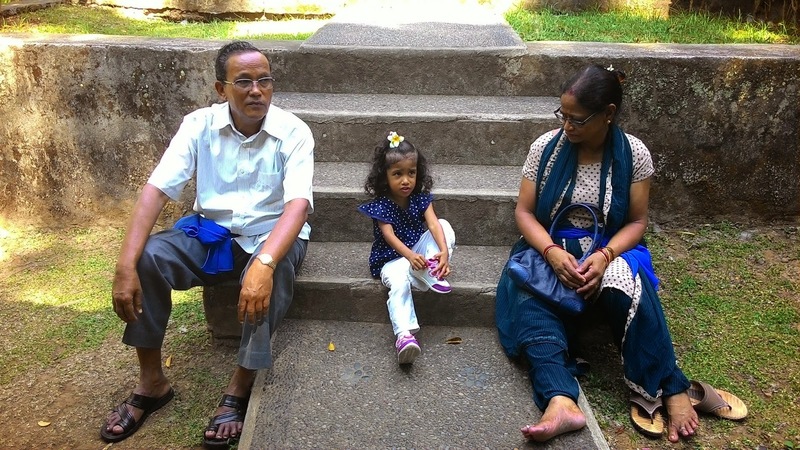 It was a looooong drive to Kintamani but we stopped by the Goa Gajah temple first. 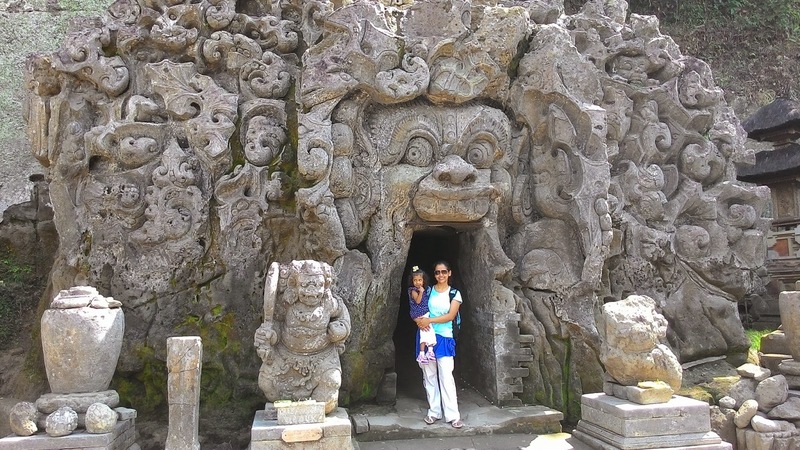 Also known as the elephant cave, this is one of Bali's signature temples to visit. 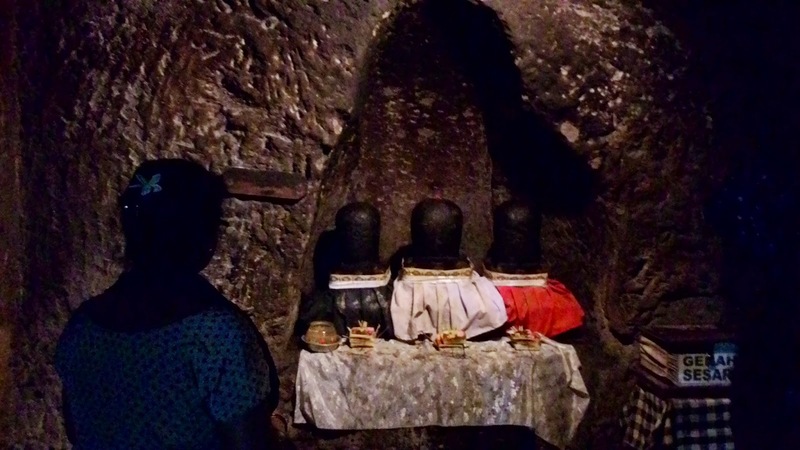 It was built in the 9th century, and served as a sanctuary. 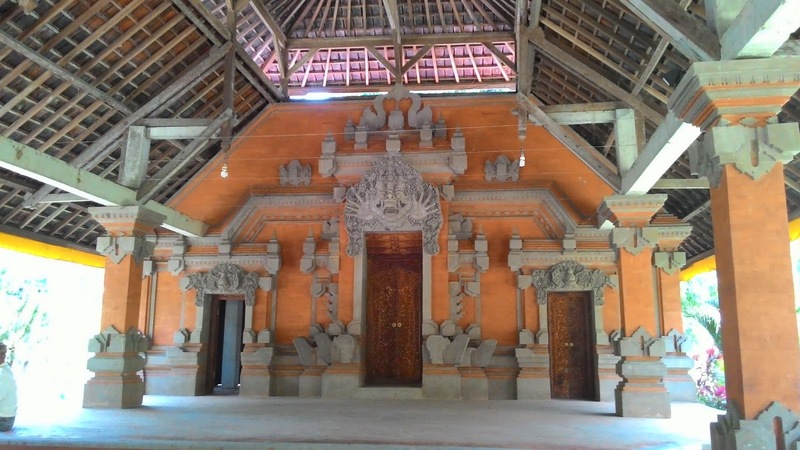 There was an entry fee for the temple, which included a sarong you needed to tie before you enter. I thought only those in shorts needed to wear it but they asked us, even though we had our legs fully covered, to just tie it around our waists. So we did. Even Xena. The entrance to the cave has various demons carved into the rock. 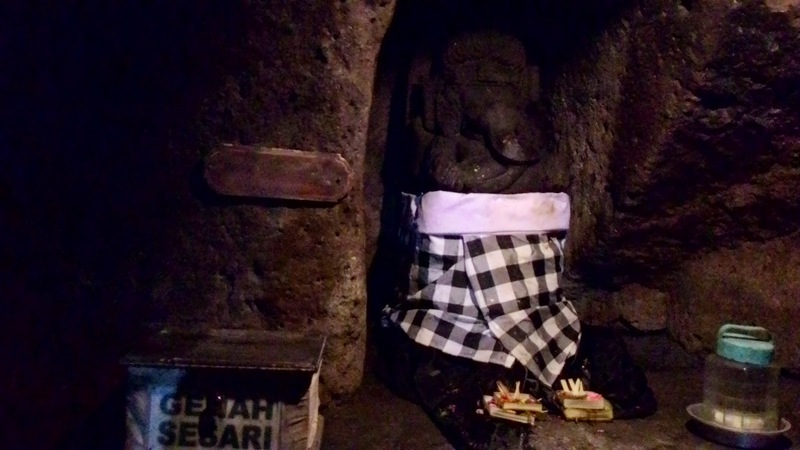 The primary figure, whose mouth you enter to go into the temple, was once thought to be an elephant, and this is what gave Goa Gajah the nickname 'elephant cave'. 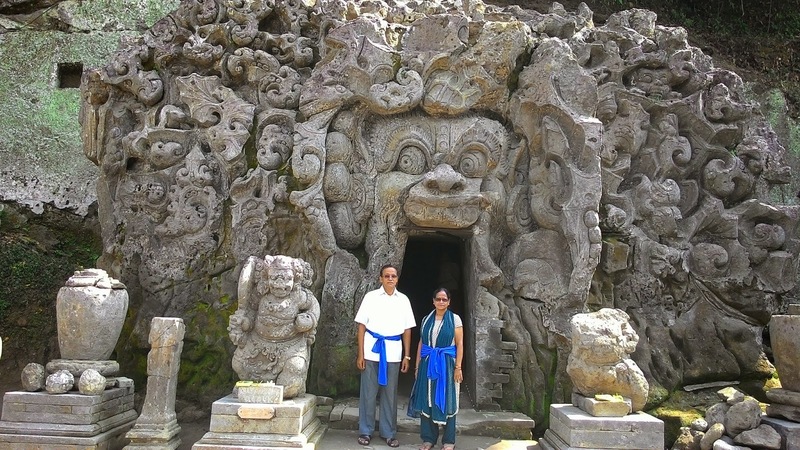 Mom and Dad pose at the entrance. Xena and me pose at the entrance. It was dark and cramped inside the cave. But we managed to see idols of Trilinga and Ganesha. 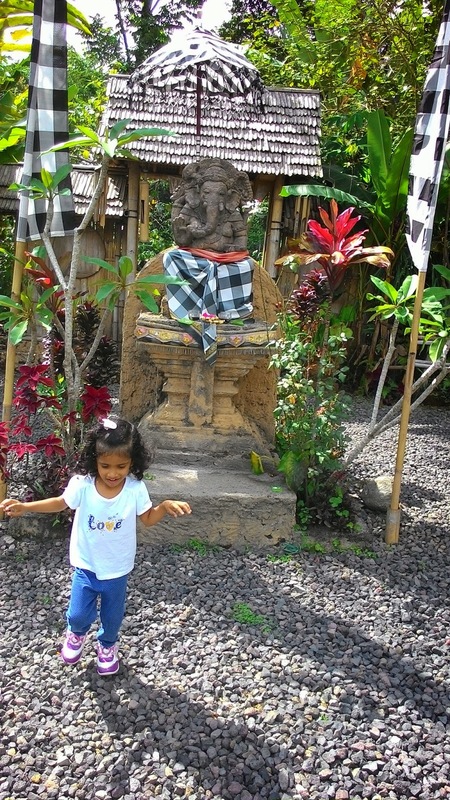 Hindu Gods are widely worshipped in Bali. 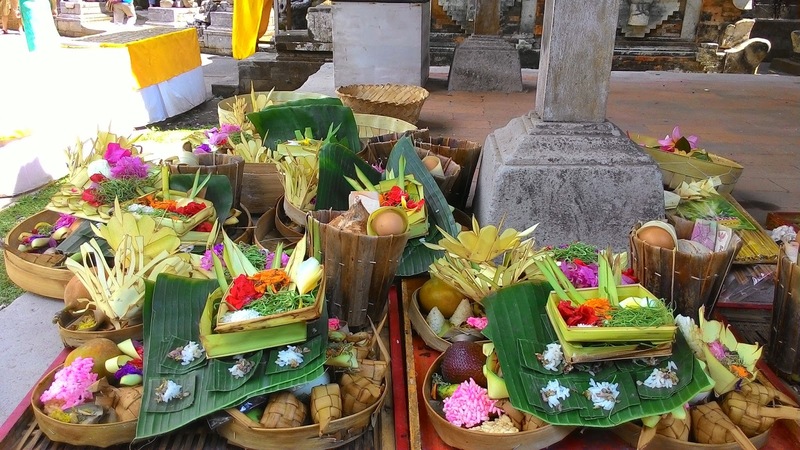 In fact, 90% of the Balinese are Hindu, even though Indonesia is a predominantly Muslim country. Apparently, Hinduism had come from India in the 5th century and stayed on. 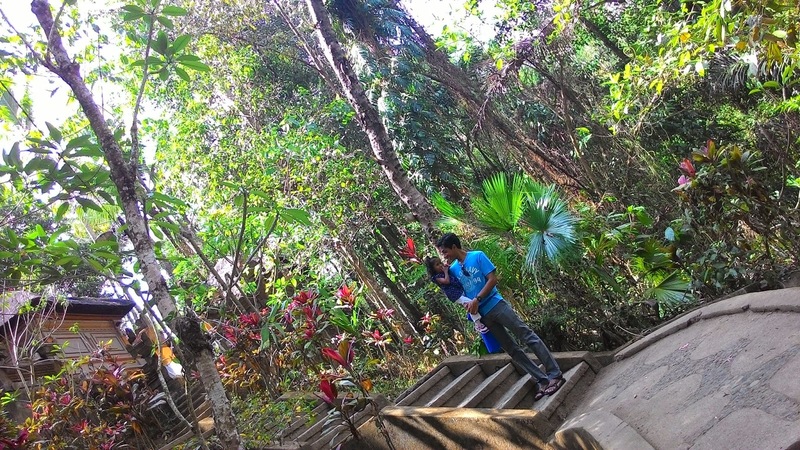 We got out of the cave pretty quickly (there really wasn't much inside) and walked around the outer areas of the temple. We were amazed to see eggs in the basket of offerings! I've never seen eggs in a temple! 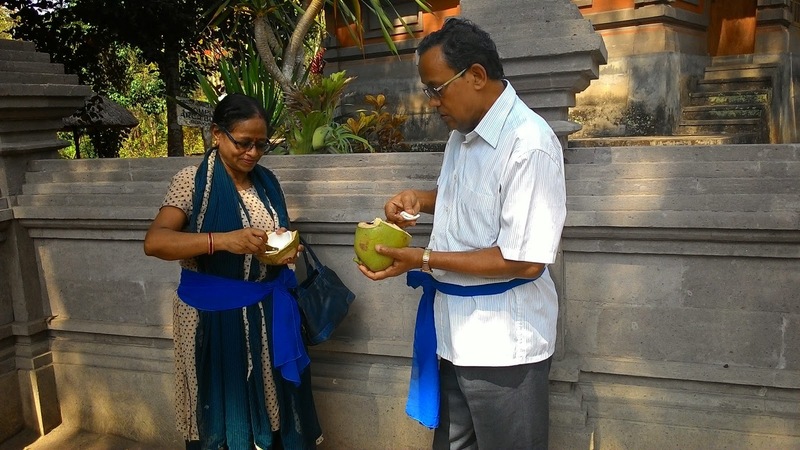 It was an incredibly hot day, and we stopped to have some yummy coconut water. It cost 15 thousand Indonesian rupiah, or 1.5 Singapore dollars. We couldn't get over our amusement about the exchange rate. "Ever had 15-thousand wala coconut water?" I asked Dad. 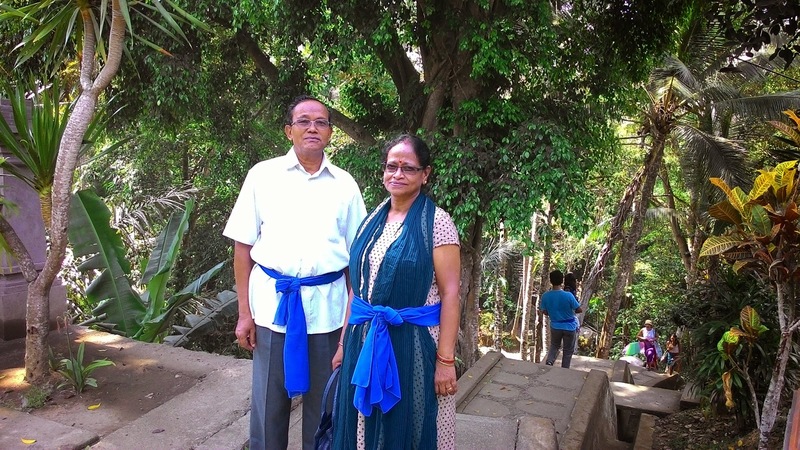 We reached a part with several flights of steps, some of them uneven and steep, so my parents rested while we walked around and saw everything. Soon, we were done and rejoined them. Can you spot them resting? Xena decided that she needed a rest too. She was so tired from being carried by her Dad all along. And then she suddenly spotted my sunglasses, and immediately wanted hers too. 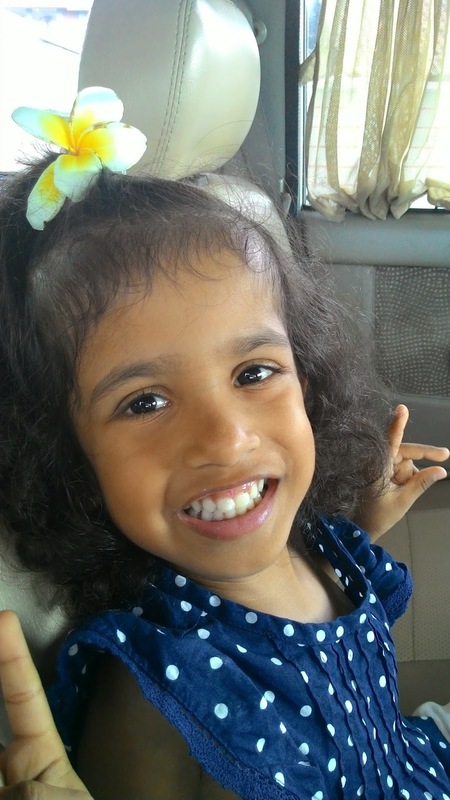 Three-year-olds can be such divas! 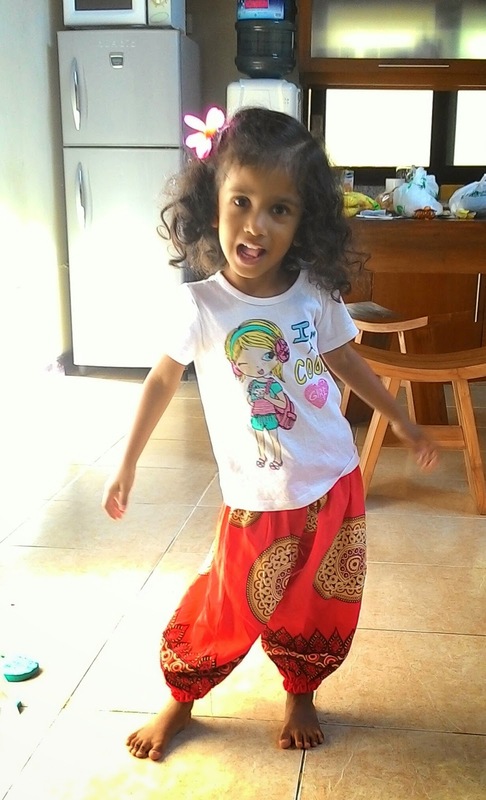 We found some souvenir shops outside the temple, and Viv pointed out a pair of pants he thought I'd look good in. I totally agreed and soon we were armed with several pairs, including a tiny pair for Xena! This was taken the next day, but I couldn't help posting it here. Love the pants! 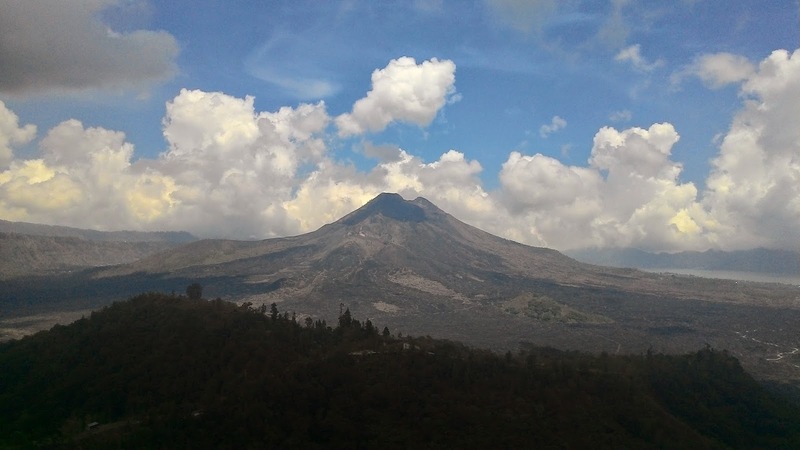 We set off again for Kintamani, a looong uphill drive and had the opportunity to realize that Xena might have mountain sickness. She threw up twice in the car, but now, armed with years of experience, Viv and I are like ninjas in this regard. We go everywhere armed with plastic bags and can tell just by a look from Xena's face that she's about to throw up in the next three seconds. So neither the car nor her clothes were ruined. She was soon back to her chatty self, and we breathed a sigh of relief. She came up with this random song called "I love you, Maggie Maggie" and must have sung it 892374983250804 times throughout the trip! 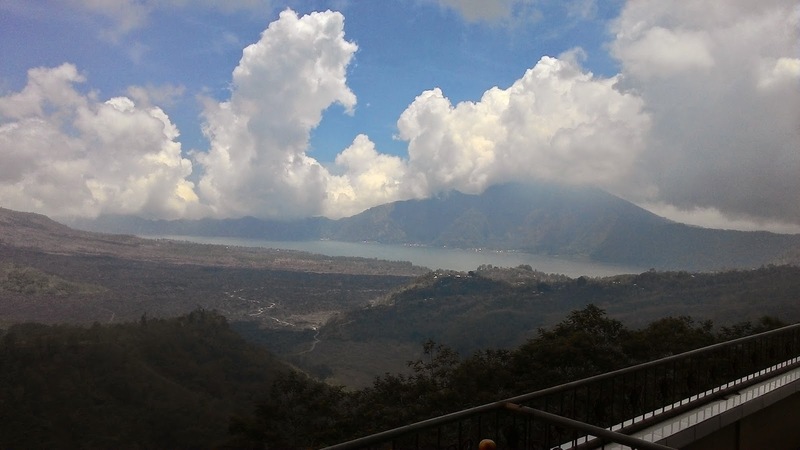 There was a fee to go into Kintamani area - 11000 rupiah per person. 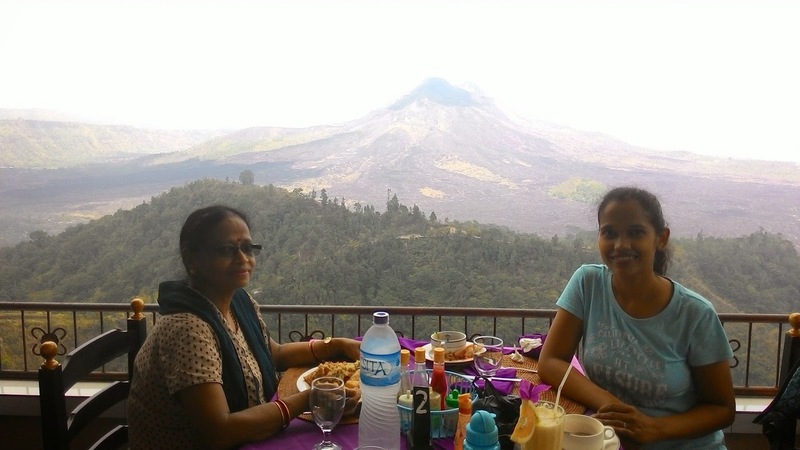 I'd read about this restaurant that had this amazing buffet against the Mount Batur volcano backdrop and our driver knew exactly what we were talking about. It was truly amazing. The food was nice and the view was spectacular. 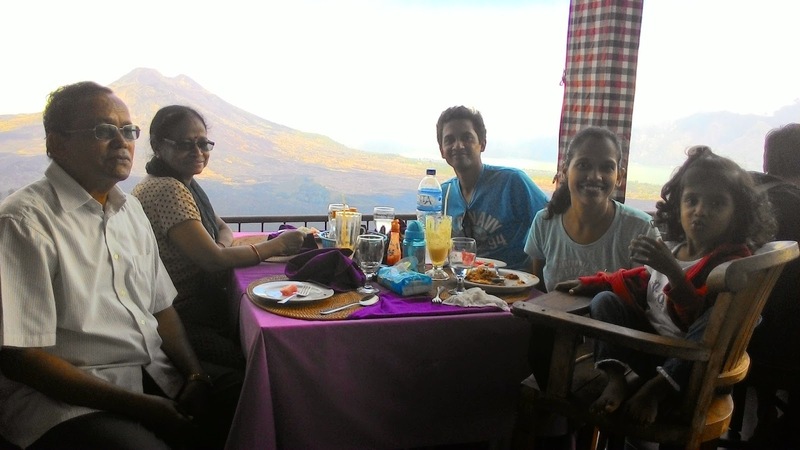 I couldn't believe we were eating with such a clear view of an active volcano! We even spotted a patch of forest which had escaped the lava. It looked amazing amidst all the rock. The waitress offered to take this family photograph of us. 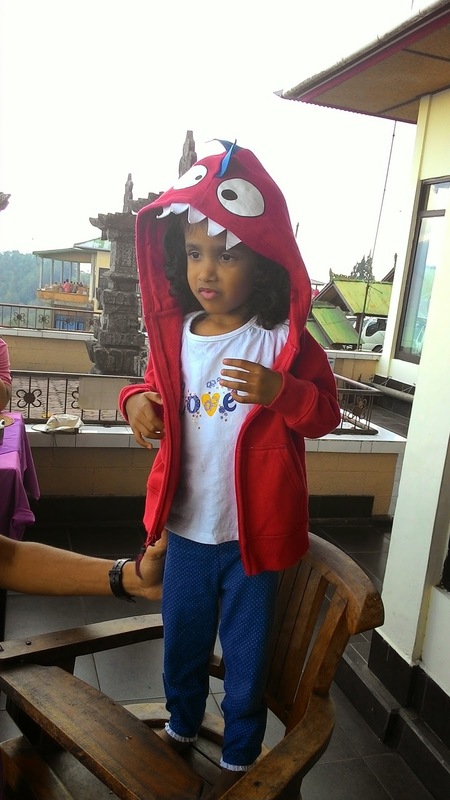 Of course, the food did not interest Xena much, so she did some roaring, which she does every time she wears this dragon hoodie of hers. Dad and Mom enjoy the view. We must have sat there for hours and hours. 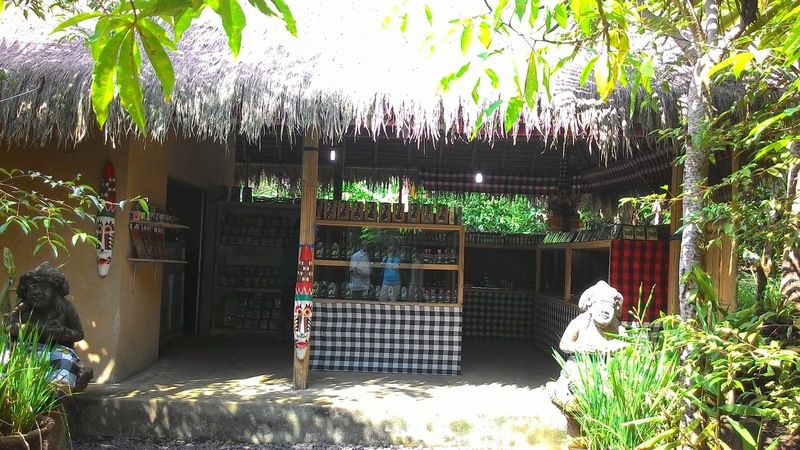 After lunch, we headed to Laksmi Bali plantation to see how kopi luwak was produced. 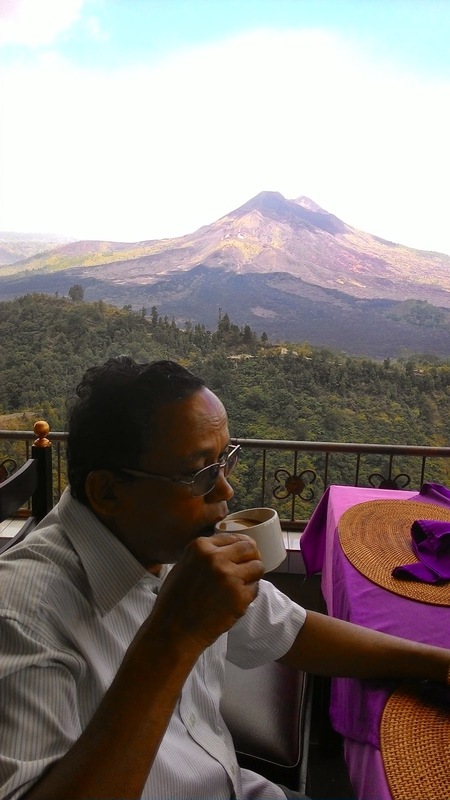 Yes, the infamous and expensive coffee which is obtained from the civet cat's poop! Those of you who have watched 'The bucket list' would surely know. Xena had just started napping so Viv said he would stay back in the car with her, while the rest of us saw the plantation. But of course the excitement around her was too much so she woke up in exactly three minutes. On the plus side, it meant that Viv and she could join us. 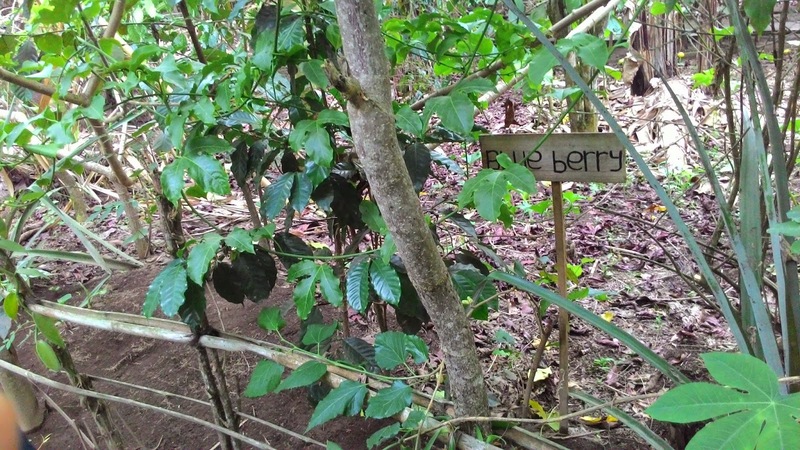 Though I'd expected it to only be a coffee plantation, it turned out to be much more. They had vanilla, pandan, pineapple, blueberry and what not. 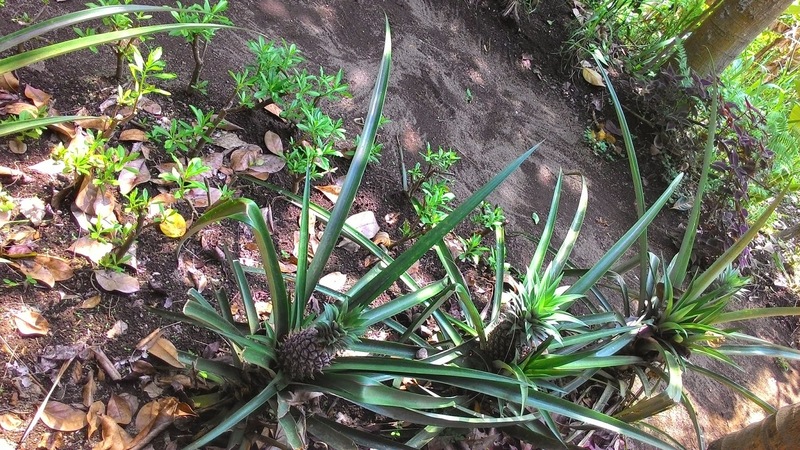 Plants that I'd never seen in my life! Tort ginger. I wasn't quite sure what on earth it was, but Dad was fascinated. More on that later. 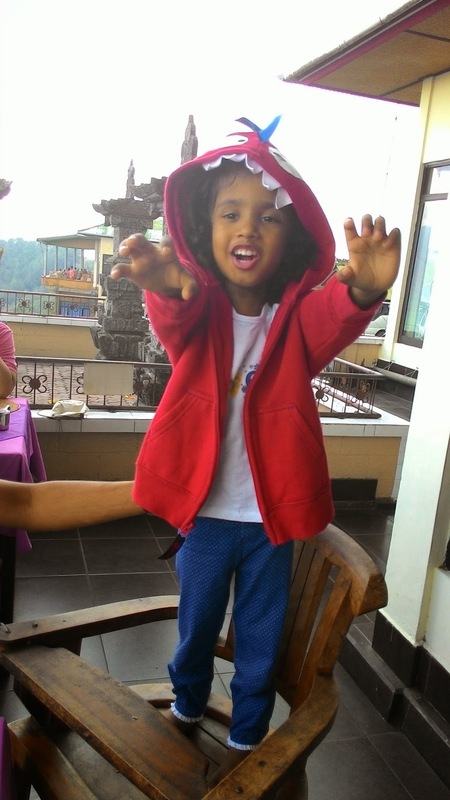 And then we reached the kopi luwak part. 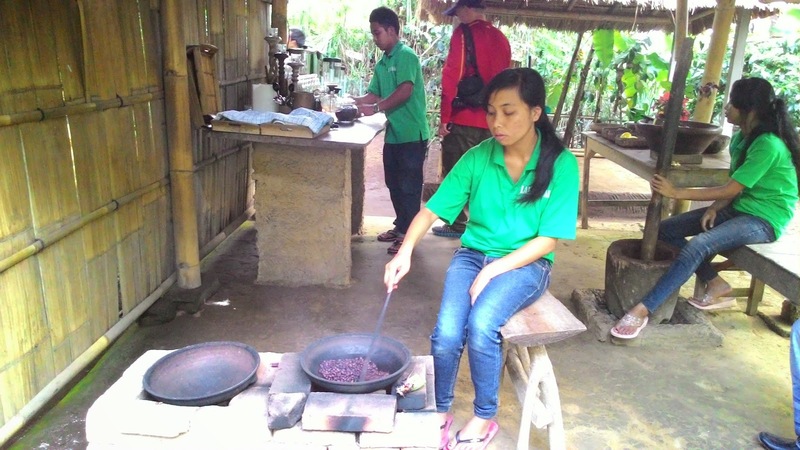 Our guide explained to us that the process of making kopi luwak was less disgusting than it sounded. 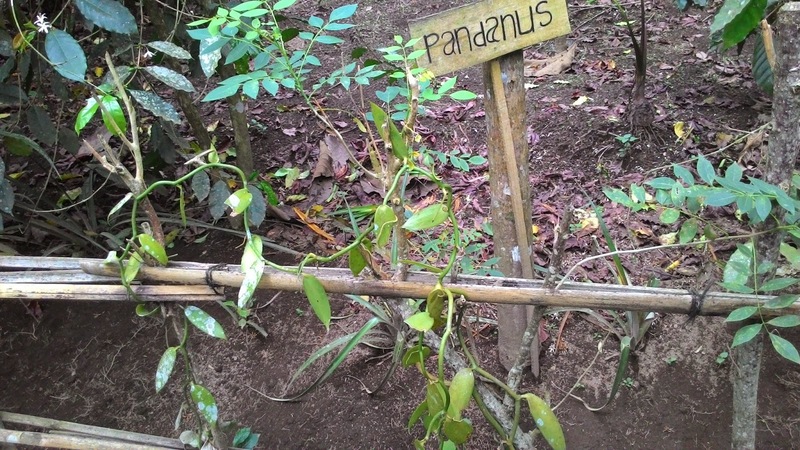 The coffee beans stayed whole, protected by a hard shell, as they passed the digestive tract of the civet cats. 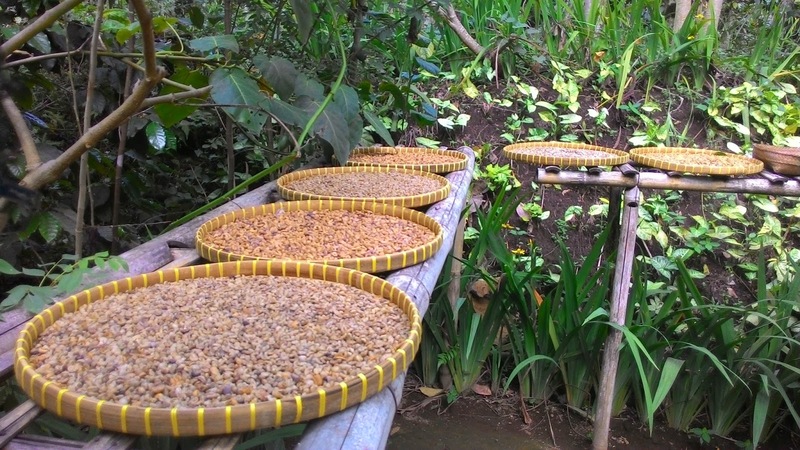 The beans were handpicked out of the cats' poop, but processed just like any other coffee. The only difference is that since they'd been inside the cats' digestive tracts, they fermented differently, giving them a different flavour. 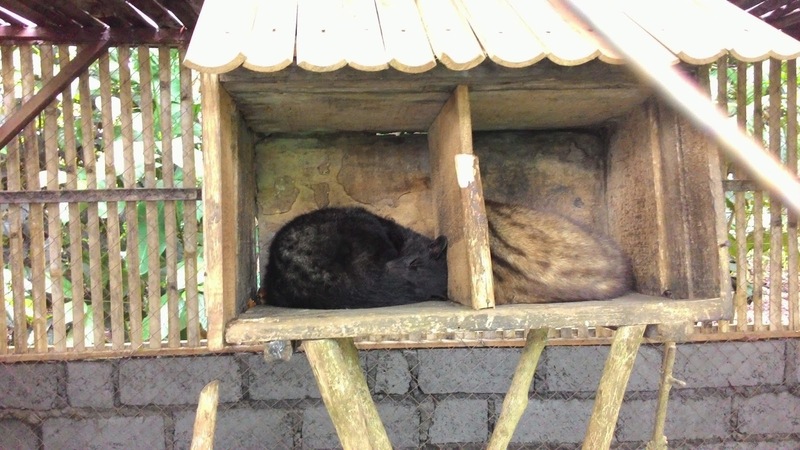 These young civet cats were kept in cages and then released when they were old enough to fend for themselves. 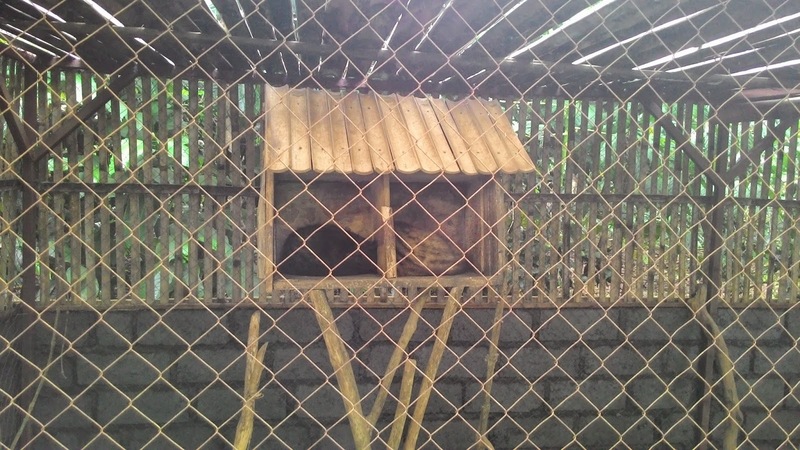 Our guide offered us a taste of kopi luwak for $5, but none of us wanted to. 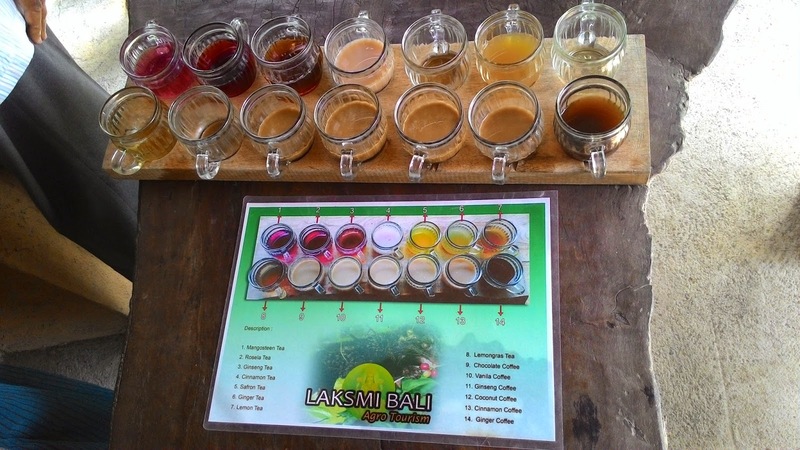 But we did sample 8 types of tea and 6 types of coffee. Mom bought some sugar-free lemongrass tea at the plantation's shop near the entrance. We felt compelled to buy something because the guide had been plying Xena with chocolates, and for once, she was eating them! A napless Xena frolics around. 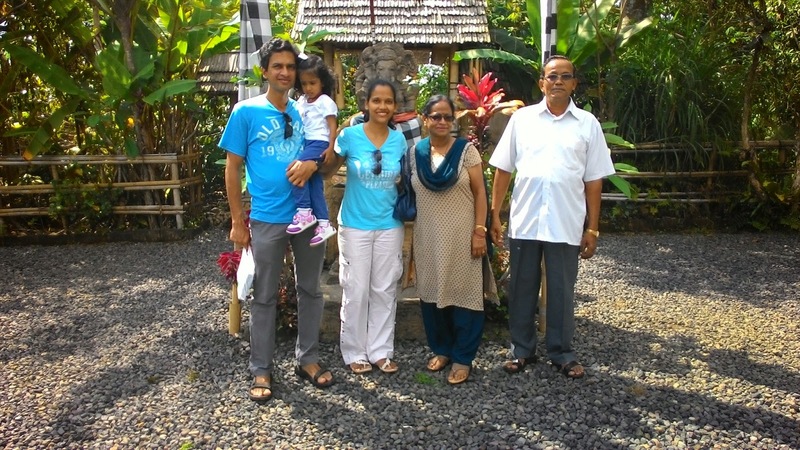 Our driver took this family photo for us. 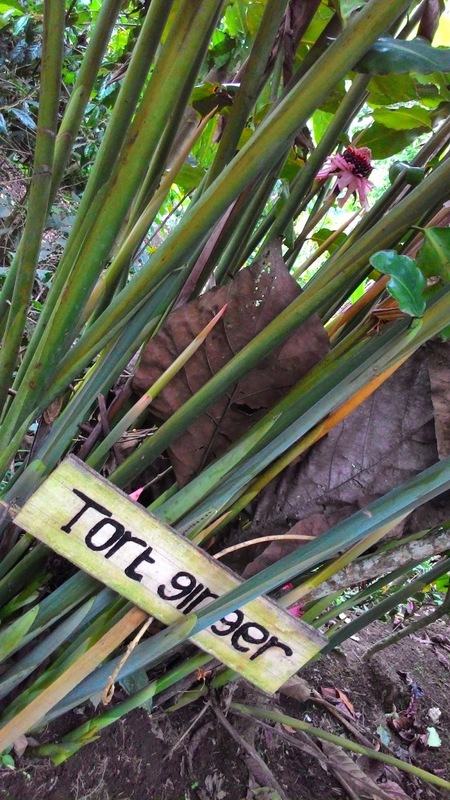 Suddenly, out of the blue, my dad asked the guide if he could get a cutting of the tort ginger plant. We were all a little horrified, but that's my Dad. He sees a plant he likes, he wants a cutting for his garden. I thought the guide would turn him down, but he actually took him back into the plantation, and after about 10 minutes, Dad returned with a big cutting and a bigger grin on his face. 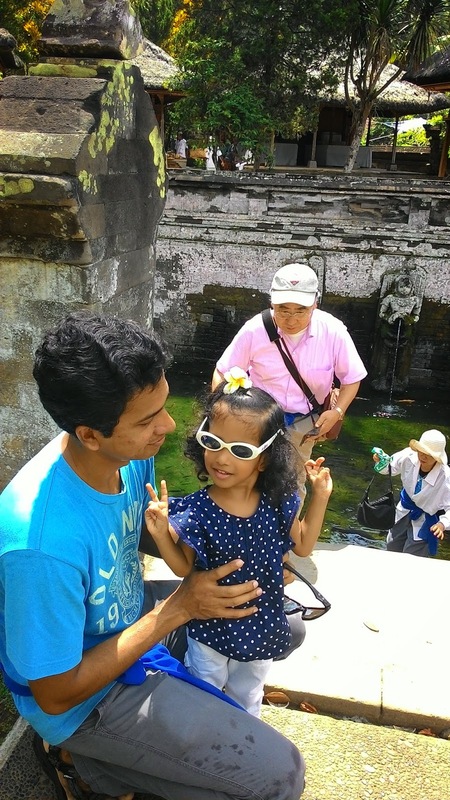 After this, we headed to the rice terraces in Ubud. 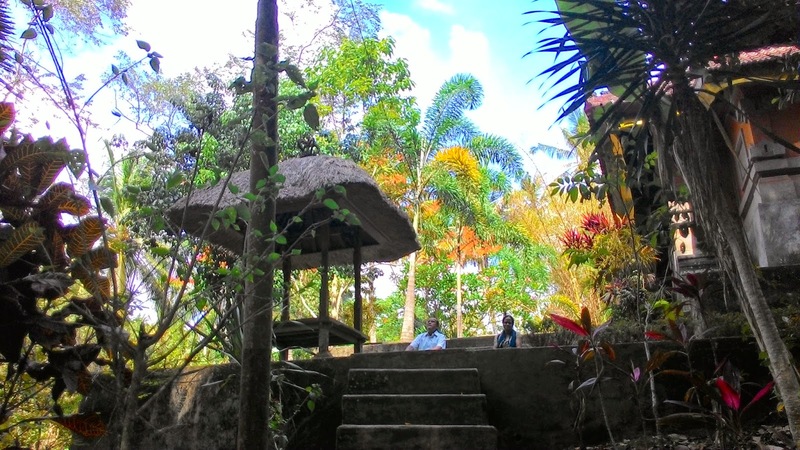 There was a fee of 5000 rupiah per person just to see the terrace farms. 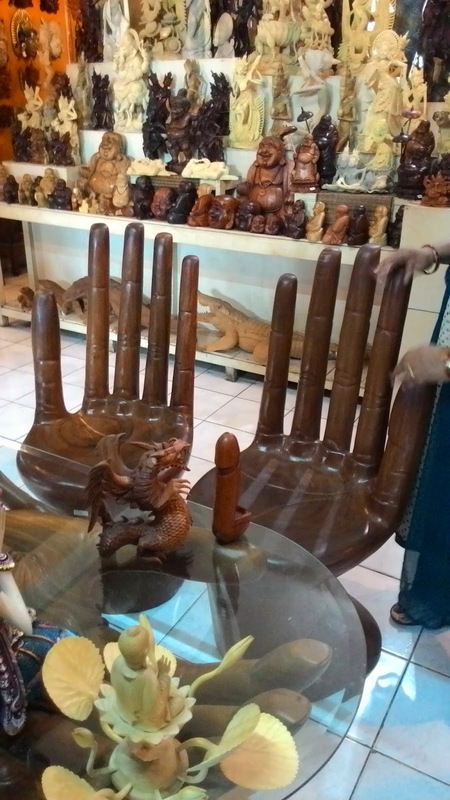 Talk about Bali being touristy. But the fields were really beautiful and worth a visit. 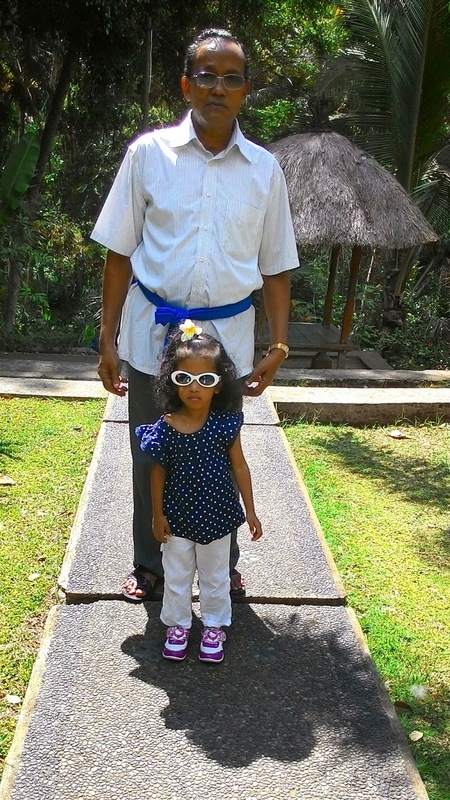 Dad and daughter admire the rice fields. Just outside the fields were lots of souvenir shops. 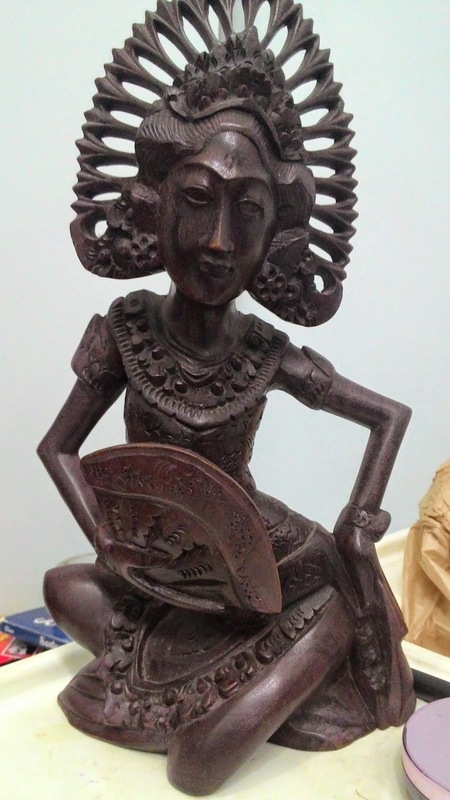 Dad bought a Balinese sculpture that we managed to bargain down from 400,000 rupiah to 25,000. 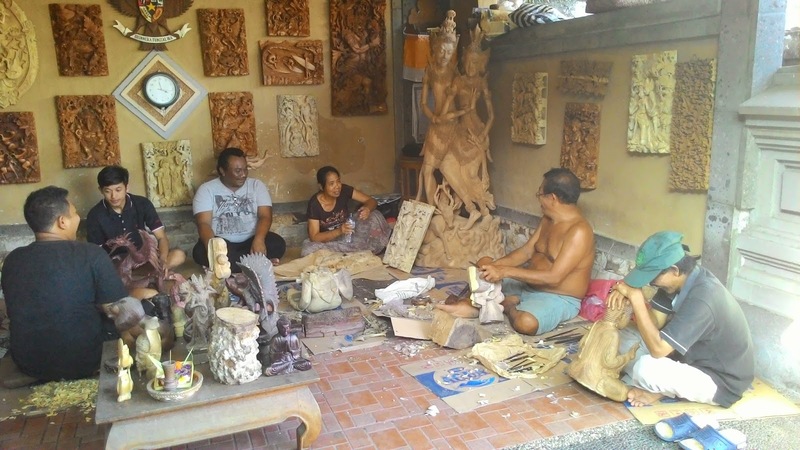 Mom and Dad were interested in seeing more woodcraft, so our driver took us to the artisans' village. 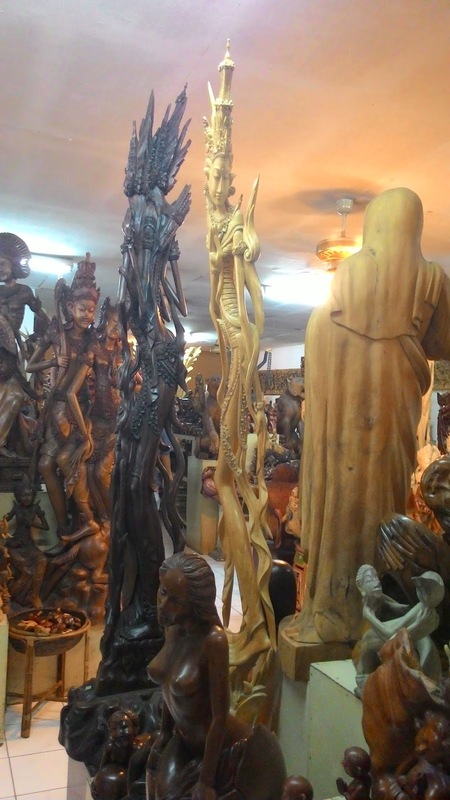 We had the opportunity to see some wood carving in action. The showroom inside was quite fancy, and full of exquisite woodcraft. But their price tags made us run away. 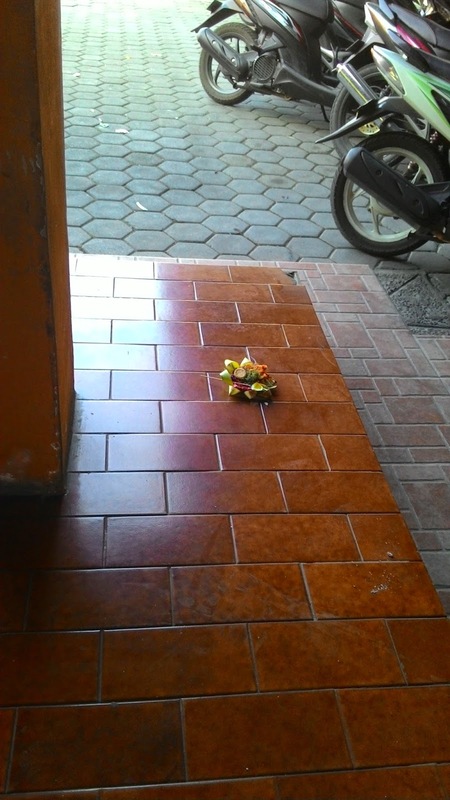 An offering just outside the showroom. These are incredibly common in the deeply religious culture. You even find them by the side of the roads. Finally, we were done with the day, and longing to get some rest. Luckily, it wasn't too late, and we got back by about 5. Xena finally went to nap at 6 and woke up super cranky at 7, so we decided that dinner out was out of the question. Viv went out and packed dinner for us. Soon, we were ready to hit the bed. What a long and incredible day we'd had. I think I dozed off as soon as I hit the bed. Good for me, because the lovely rooster was all set to wake me up at 4 am again! 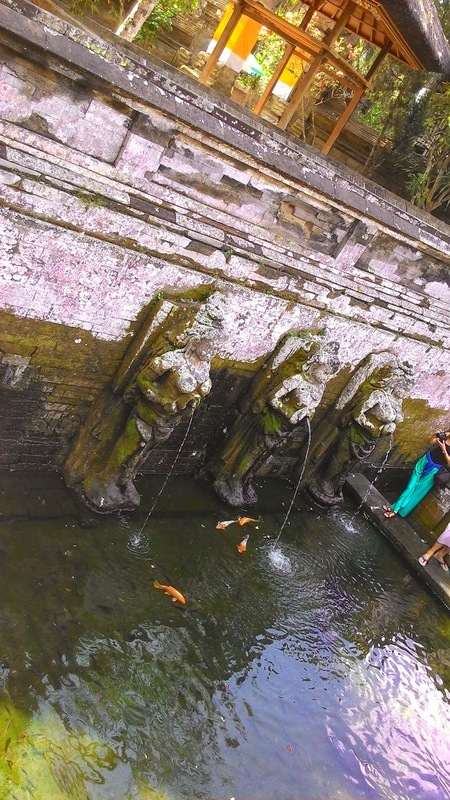 Click here for Bali - day 3!